Thanks so several of you guys I found out about Nonfiction November a very cool reading project hosted by four super book bloggers. There are weekly post topics, readalongs and there is even a nonfiction book exchange. Didn’t I tell you this was cool? What was your favorite nonfiction read of the year? Midnight In Mexico by Alfredo Corchado. A very interesting perspective from a journalist’s point of view of the drug wars. What nonfiction book have you recommended the most? I don’t often recommend nonfiction as I don’t read as much but one book that I really enjoyed and think nonfiction readers would also find interesting is The Immortal Life of Henrietta Lacks by Rebecca Skloot. What is one topic or type of nonfiction you haven’t read enough of yet? True crime. You know I love mysteries but when it comes to crime stories I rather they be the made up kind. 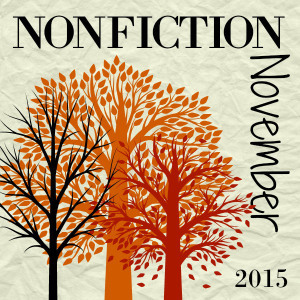 What are you hoping to get out of participating in Nonfiction November? I don’t often read a lot of nonfiction so I hope this reminds me to get out of my comfort zone. So, with nonfiction in mind I have the following books checked out from the library: Being Mortal by Atul Gawande, The Folded Clock by Heidi Julavits, Behind the Beautiful Forevers by Katherine Boo, and Dr. Mutter’s Marvels by Cristin O’Keefe Aptowicz. Have you guys read some of these? What do you recommend. And, if you have some good recommendations for nonfiction reads let me know. I feel a bit lost in that section of the library/bookstore. Yes, Henrietta Lacks! loved it – amazing. Also, did you hear that one of the granddaughters of Henrietta (maybe a great grand?) just received her RN and was in the news. I saw it on Facebook. You’ll get lots of great recommendations this month. Just reading everyone’s posts this week has me adding a lot of books. I really thought that Being Mortal was worthwhile. I read almost no non-fiction, but did read that one this year. Well worth the time. Being Mortal is an excellent book – my most recommended of the year! Behind the Beautiful Forevers was really good on audio. My book club read it and then we all went to hear the author speak at a nearby university. The Folded Clock looks great, too. I borrowed it from the library, enjoyed the first several pages, then had to return it unread because of other holds. I loved Henrietta Lacks on audio, too. Being Mortal and the Beautiful Forevers are both on my radar too. I usually find true crime to be too disturbing, although occasionally I feel the need to try and work out why mankind can be so very unkind to its fellow human beings. I don’t know if I will actually participate in the challenge, but have been reading more nonfiction than usual for the last two months. Haven’t read any of ones you mention, and will keep the titles in mind. I read The Folded and Clock and really liked it. An interesting take on the diary form. I both love and hate reading about true crime. Love because it’s not cliched and it’s usually a frightening book. Hate because it actually happened so some people suffered as a result of it and now I am enjoying reading about it. 🙁 I know that’s not true but still – mixed feelings! Behind the Beautiful Forevers is such an interesting book, and really beautifully written. Definitely recommended, hope you get to it this month! It sounds like you have some great books on your to-read pile! I typically don’t read much true crime either. I find fictional crime much less scary and much less depressing. Welcome! I hope the event helps kickstart your nonfiction reading. There’ll certainly be lots of recommendations to see! Oh, I’m so glad to hear you mention Midnight in Mexico! I checked it out on a whim to read for Nonfiction November without hearing much about it. I’m definitely looking forward to reading it! Thanks for joining us for Nonfiction November!